All H.I.D. (High Intensity Discharge) components sold on this site are strictly regulated for the following purposes only: OEM automotive replacement Off-road, show and track automotive use Consumer & commercial illumination (indoor or outdoor) & other professional applications. Our components can replace any compatible OEM HID component as needed and Halogen bulbs. This includes but not limited to: ballast, igniters, wire harness and OEM HID capsules. Our patented, enhanced and more superior 2008 version HID ballast provides high quality and high performance at a super competitive price. Our ballast has a built in ignitor, where other HID Conversion kit has a ballast and separate ignitor. HID kits with a separate ignitor are prone to burn out and doesn't have the strength or durability of our Xenon-Vision Kit. The ballast ignites & sustains the arc at the power of 35W. 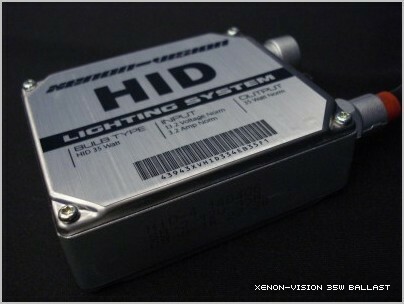 It has the best compatibility to aftermarket HID capsules because of its current-control strategy and ignition method. Its reinforced protection mode also guarantees maximum safety. Hella, Phillips and Osram only make D2S & D2R base bulbs, they do not make halogen based bulbs, which mean if there are Phillips HID Kits that is made for your car bulb size (ex. 9006, h1, h4, ect) the base of the bulb has been reshaped to fit your car. Hella, Phillips and Osram do not make aftermarket HID Kit. Hella, Phillips, and Osram forbids and condemns any company who uses their ballast for non-factory application. BMW & Mercerdes-Benz use Phillips, so they are the best, this is a false fact due to the Phillips components that came stock on the vehicle are the best because they were specifically designed for the vehicle. If you take the same components and apply them to a different vehicle, then it is not the best solution anymore. This applies to re-based Phillips HID Kit. D2S & D2R bulbs are re-based to fit your halogen based headlight, which the lens isn't made for your headlight. D2S & D2R bulbs are made for HID Housing Headlight and may not fit your currently headlight housing perfectly. Power Off Stand-by Mode: When the input voltage drops below the Minimum Operating Voltage or over the Maximum Operating Voltage, the ballast immediately goes to this mode. Otherwise, the ballast starts in the following Running Mode. Running Mode: When the ballast operates in this mode, it regulates the open circuit voltage and raises the input voltage of the ignitor. When the capsule is started, the ballast controls the light output specification by controlling the lamp power. The output current is also controlled between the Maximum current and Minimum current. Safety Shutdown Mode: When the ballast detects faulty condition, it goes into this mode and powers itself off. Faulty conditions occur when the lamp voltage exceeds the normal range. Ballast can be reset by being powered off and then on automatically. Our ballast has undergone the most extensive testing in the industry: Testing (short duration, long duration, life) / EMC (radiated emission) / Conducted Emission / Radiated Immunity / Conducted Susceptibility / Thermal (and humidity cycling) / Thermal Cycling / Thermal Shock / High & Low Temperature Exposure / Mechanical (vibration, shock, water jet, dust) / Water Testing. Our patented ballast design separates the input voltage of the ignitor from DC link voltage using auxiliary winding, which results in the use of a lower voltage rating power devices for HID capsules ballast system when compared with conventional system. The light output response meets the light output specification with over 95% efficiency.